Preheat oven to 350°F. In a small bowl, combine cranberries and hot water. Let sit about 5 minutes while you prepare the rest of the dough. In the bowl of a stand mixer, combine egg and brown sugar. When creamy, add in 1/2 cup of the whole wheat flour, baking powder and baking soda. Add in cranberry-water mixture with the rest of the wheat flour, bran and vanilla. Combine and add chopped walnuts to the mix. Pour batter into a lightly greased loaf pan. Bake about 40-45 minutes, or until a toothpick inserted in the center comes out clean. 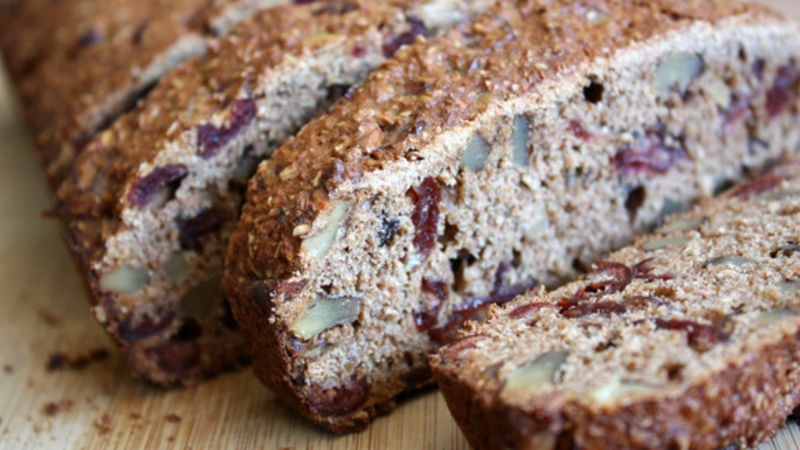 If you are ever looking for the most flavorful, heartiest, healthiest, easiest recipe for Cranberry Walnut Bran Quick Bread (I can’t generalize too much here), this is it. This recipe was originally intended to be something else. That happens a lot, doesn’t it? You intend to make waffles and you end up making crepes. Or your carrot soup turns into split pea soup with ham and chopped carrots. And sometimes, your plan to make an elaborate homemade steak-and-potato dinner turns into a fast-food burger-and-fries run. We can’t help these things – they just happen. When creating this recipe, I knew I wanted it to be flavorful, but relatively healthy. I had a big bag of bran sitting in my refrigerator, waiting to be used. I also had a bagful of dried cranberries and a container of chopped walnuts. I didn’t want to leave anyone out, so, I used all of them. And the result is spectacular! This quick bread doesn’t mess around. It’s not the spongiest, lightest quick bread you’ll ever have. It has more of a fruitcake-like consistency, but for those averse to fruitcake I can promise you it tastes nothing like it. My husband says this bread tastes a lot like – no joke – ice cream. I must admit I didn’t pick up on that flavor when I tried it, but maybe you will. What I tasted was a hearty medley of sweetness, nuttiness and a hint of that amazing oatmeal-like bran flavor. Cranberry Walnut Bran Quick Bread is a perfectly delicious and very filling breakfast bread, and goes great with cream cheese slathered on top or by itself as an afternoon snack. Heck, it might even help cure that morning-after feeling on New Year’s Day. Who knows – if it tastes like ice cream, this bread can probably do all sorts of other wonders, too.